This complete retrospective provided a fascinating opportunity to track the evolution and growth of Arietta as the winery reached its twentieth anniversary. Arietta was born as a partnership between the Hatton and Kongsgaard families. Auctioneer Fritz Hatton was working for Christie’s in the mid-1990s when he was asked to help sell a few lots at the Napa Valley Wine Auction. It didn’t take long for Hatton to strike up a friendship with John Kongsgaard, with whom he shared a deep passion for classical music going back several decades. Among other things, Hatton is a concert-level pianist, while Kongsgaard’s interest in music spans composition to hosting an annual festival that draws some of the most highly respected artists in the world. The Hattons and Kongsgaards soon formed a partnership. The new Arietta label would focus on Bordeaux reds, while the Kongsgaards’ winery specialized in Chardonnay and Syrah. John Kongsgaard made the wines, Fritz Hatton’s job was to sell them, and Kongsgaard’s wife, Maggy, took care of the business. In 2005, after a decade of working together, the families agreed to dissolve their partnership. The Hattons bought out the Kongsgaards, who took the proceeds of their sale and purchased the Atlas Peak ranch where they live today. Andy Erickson, John Kongsgaard’s hand picked successor, took over winemaking duties at Arietta in 2005. Since then, the Arietta range has grown to include a number of selections. I tasted all of the wines in this complete retrospective with John Kongsgaard and Andy Erickson in October 2016 at Arietta. It is the rare producer who wants to show a complete survey of their work. Most owners and winemakers would prefer to cherry pick the gems. Over the arc of time though, we all have our ups and downs. Not all wines can be outstanding. That is a given. But complete verticals really do afford the taster a unique perspective on the evolution of a winery. Perhaps most importantly, there are almost always surprises. Some wines don’t develop as well as expected, while others turn out far better than originally thought. Some of the revelations were wines from vintages like 2011, 2008 and 1998, none of them highly regarded at the outset, especially 2011 and 1998. Conversely, I was disappointed with a number of Arietta’s older wines. I suspect overly lavish oak is to blame for the way some of the early vintages have aged. I have also noticed that, when young, the wines seem to go through periods of openness, and especially closure, that can be quite dramatic and frustrating. Some of that may be because many wines feature Merlot, a variety winemakers in Napa Valley often curse for its unpredictable and moody personality when young. With a few years in the bottle, though, the wines really blossom. Once again, I have to stress how well wines from lesser years showed in this tasting. Arietta makes two whites, both of which take their inspiration from the dry whites of Bordeaux. On The White Keys is Sauvignon Blanc/Sémillon that spends about nine months in barrel. 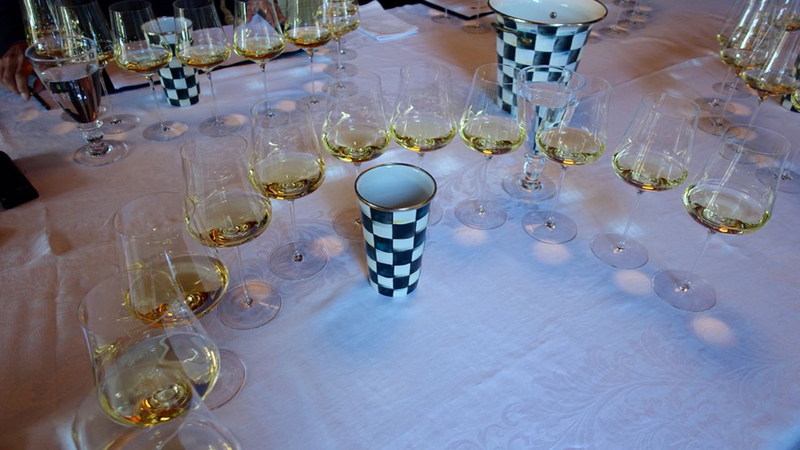 In top vintages, a few lots are selected for the Artists' Reserve, which spends two years in barrel and is made with a higher percentage of Sémillon. The Sémillon is sourced from old vineyards at Hyde, while the Sauvignon Blanc is purchased from Farina, a site on Sonoma Mountain. 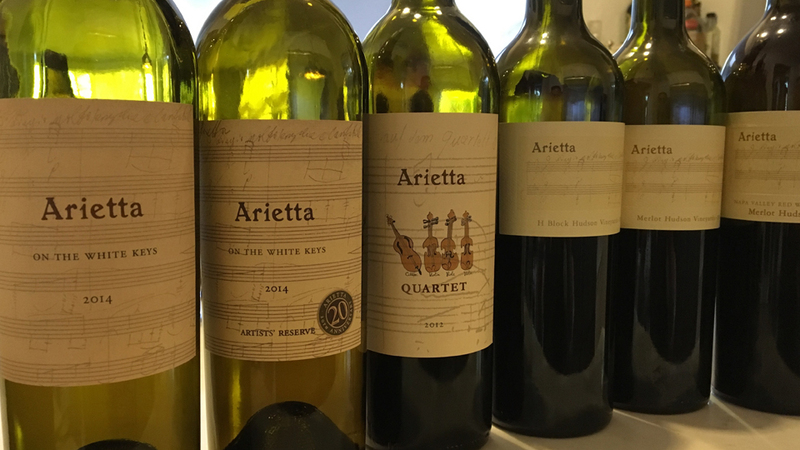 Like all of the Arietta wines, On The White Keys takes its name from the world of music, in this case the white keys that correspond to the C Major scale. First made in 2004, Quartet is Arietta’s entry-level red. In its first few vintages (2004-2006), Quartet was essentially culled from barrels that did not go into the Cabernet Sauvignon. Fruit sites were top notch and new oak was 100% because all of the lots were conceived with the idea that they might make it into the top label. Much of the fruit during this time came from David Abreu’s Las Posadas vineyard. Since around 2007, Quartet has been made from the outset to be an entry-level offering. The blend is typically 50% Cabernet Sauvignon and the rest Merlot, Cabernet Franc and Petit Verdot. Although Quartet is made in a style that offers quite a bit of early appeal, based on the track record so far, it also ages quite well. 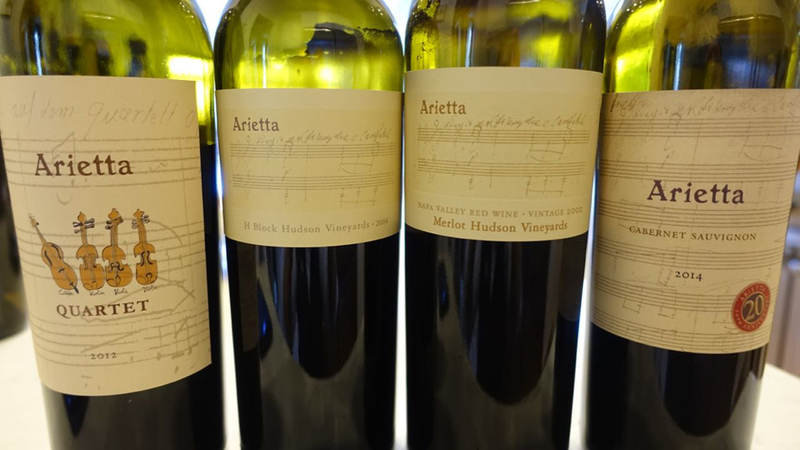 The first few vintages of Arietta’s Cabernet Sauvignon were mostly made from David Abreu’s Las Posadas vineyard on Howell Mountain. Since 2007, the main fruit source has been Meteor, one of the most highly regarded vineyards in Coombsville. Arietta also buys fruit from Huckfeldt, which lies at the southern end of Coombsville near Paul Hobbs’ Nathan Coombs estate. One of the recent evolutions at Arietta has been a move towards picking the Cabernet a bit earlier than in the past. The 2014 and 2013 are good examples of that, but both wines are also on the lighter side. I was not at all surprised to learn that starting in 2015, picking times have been moved back again. In top vintages, Arietta releases the Cabernet Sauvignon 88 Keys, which is a selection of the top two or three barrels in the cellar. For 88 Keys, the winemaking team is looking for barrels that are complete on their own, hence the reference to the full 88 keys on a piano keyboard. These lots get an extra six months or so in barrel. So far, the 88 Keys has been bottled in only three vintages; 2010, 2012 and 2014. 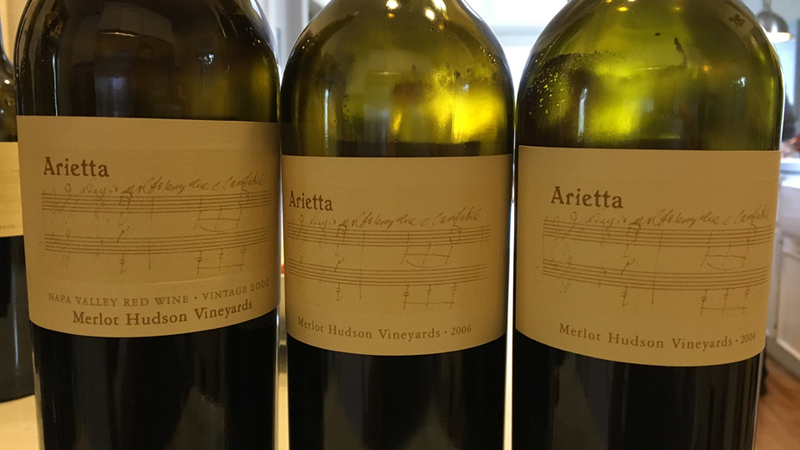 Arietta’s Merlot emerges from Lee Hudson’s well-known vineyard in Napa Valley’s Carneros district. The wine was born in 1998, when John Kongsgaard found that he had some Merlot left over after putting together the blend for the H Block wine. The Merlot was too good on its own to discard, so it was bottled separately. The Merlot was not a permanent part of the Arietta range until 2011. That year, Arietta also switched over to the I Block, which are the oldest Merlot vines at Hudson. The original Arietta wine, H Block Red Wine is a Cabernet Franc/Merlot blend from Hudson. The vineyard was planted by Lee Hudson in the early 1980s. John Kongsgaard has bought this fruit continually, in every vintage, since the mid 1980s, starting with his days at Newton. At Arietta, H Block has been made in every vintage except 2010, when the late season heat spikes roasted the fruit. Today, the Cabernet Franc is sourced from H Block, while the Merlot typically comes from the G and I Blocks, which are adjacent. The fruit is co-fermented, an approach that yields highly distinctive wines. In the early days, H Block saw 100% new oak, which resulted in accelerated aging for several vintages in the late 1990s and early 2000s, some of which are also flattened by oak to the point of being hard to distinguish from each other. Variation one is a blend of Merlot and Syrah. 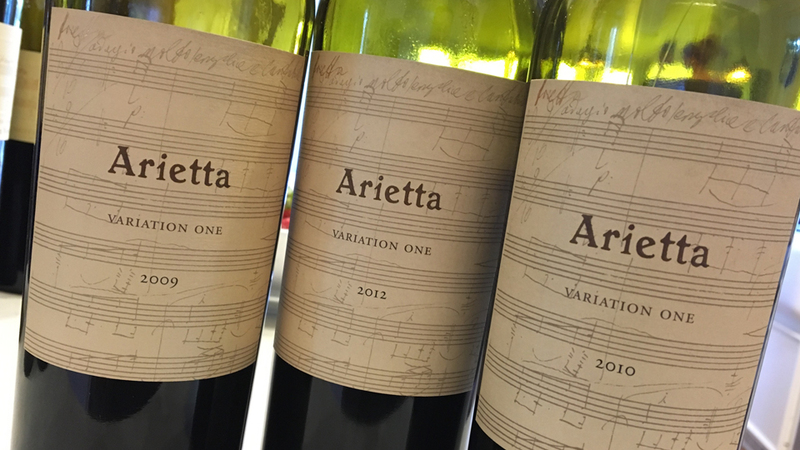 At the time Variation One was first conceived, Arietta did not have a Merlot program. The idea was to blend Hudson Merlot with some of the Hudson Syrah that John Kongsgaard was using for his own Syrah. As is the case with H Block, the fruit is co-fermented. Kongsgaard adds that in the early days he always kept a bit of Merlot and Syrah separate for possible use in touching up the blends later, but found those components never added anything to the final wine. For that reason, all of the fruit is now co-fermented. Since 2005, Variation One has favored Syrah in the blend.